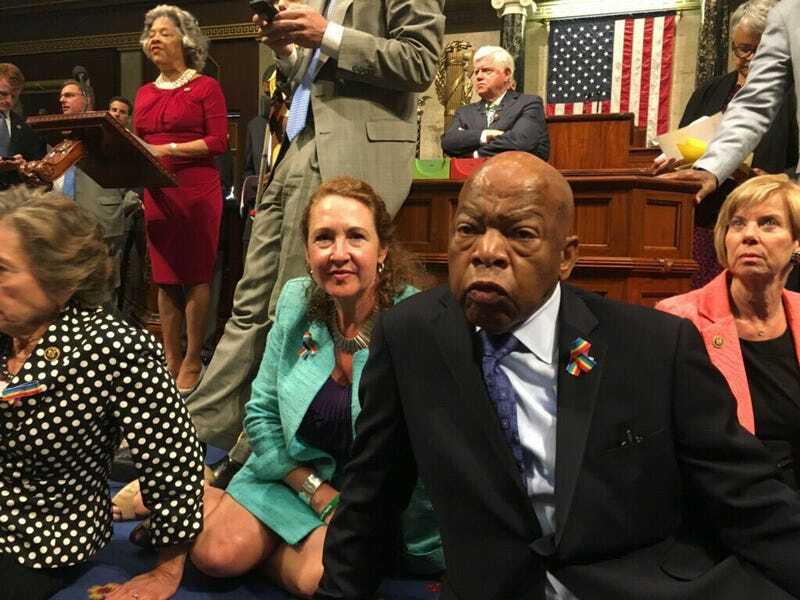 Rep. John Lewis (front, right) stages sit-in with fellow Democrats to demand a vote on gun control June 22, 2016, on Capitol Hill in Washington, D.C.
About 30 Democrats from the United States House of Representatives are staging a sit-in as they demand the chance to vote on a gun control bill, NPR reports. According to the report, the House has not yet been gaveled into session, so it is not sure when such a vote would happen. "Lawmakers are grouped in the well of the chamber, in front of the speaker's dais and in chairs in the front row," NPR's Susan Davis said. "Some members are literally sitting on the floor of the House." Rep. John Lewis (D-Ga.), a civil rights leader, announced the sit-in this morning, NPR notes, demanding that something finally be done about gun legislation in the country. "We have lost hundreds and thousands of innocent people to gun violence—tiny little children, babies, students and teachers, mothers and fathers, sisters and brothers, daughters and sons, friends and neighbors—and what has this body done?" Lewis said as several fellow Democrats stood by his side. "Mr. Speaker, nothing. Not one thing." According to Politico, the Democrats want to be allowed to vote on a "no fly, no buy" gun control bill, which would ban gun sales to terrorism suspects on the no-fly list. Read more at NPR and Politico.